"This passage of scripture should be a wake up call to any Christian who believes they can live their life however they want without consequence.... Powerful and mighty words from the great "I Am" wow!" "Praise God!! I pray through your prayers today he will send his power through my bones and heal me. In Jesus Christ holy name I ask, thy will be done father God. Amen"
"I love this. God always knows our hearts. We cannot hide anything from him. So wonderful that we have a redeemer in Christ." "There is nothing said or done on Facebook that can Top This!!!! Amen!" "Amen & Praise God for His Word &His Blessings unto us every day"
"INTENTIONS. Thoughts! Almighty One God Knows ...so you better be Clean......"
"Absolutely True. Amen and Amen!!!" "Thank you Lord for the word in which if we did not have we would surely be lost"
"The Bible,the greatest book of all times and my GOD is the King of kings.i exalt my Gods name.Amen." "Very powerful and true words but the truth always is the most powerful tool. :)"
"That's what I love about God's Word; it shows me what I'm thinking! Perfect 'mirror', to let me know where I'm at! ~~Ora"
"POWERFUL. One of my favorite Bible verses. Let us pray for God to put a burden on our hearts for those that are lost." "God 'will reveal a persons motives+intentions'+the thinking of another person, to you,as you walk closely with Him,by the Power of His Holy Spirit,if your life may be in danger,or if this person means you harm or is a liar+deceiver,I know this for a fact!Gods Word means just,what it say's,read again,with the discernment of the Holy Spirit of God!" "Lord I pray that I remain forever true, mind, heart, body, and soul, to your word Lord, and not of the way that society dictates. For your way is not thier way, and thier way, surely is not yours. AMEN!!!" "Only God can change a heart of stone to a heart of flesh. Those who do not want to hear the truth will not read or listen. That is truly sad for they miss out on the freedom that the truth gives." "And Your powerful word creates in our hearts everytime we read...THANK U!" "God is telling us spiritual things; the word tells us about ourselves-- whether we are right in God's eyes or not." "God is the only one that can read our thoughts. amen. Now , I must examine myself...If we judge ourselfs , we shall not be judged./Search me Oh Lord and see if there be in wicked way in me. /Let the words of my mouth and the meditattion of my heart , be acceptable in thy sight Oh Lord. /..."
"God word s are true.Thet He know our thoughts from a far." "Good enough for Paul, good enogh for me!" "I'm so thankful the Word of God is a discerner of the thoughts and intents of the heart....sometimes my intentions were good but the results may leave a lot to be desired." "It is through HIS pure Word that He cleans us up. Like the Apostle we can say, through the power of God, "what I once was, I no longer am". The thing is, you have read it, let the Holy Spirit work and learn to abide in it. Dig! Don't settle for the fast food fluff only too available around us. Its may tide you over but isn't intended and won't promote growth! You'll be a weak, unhealthy, Christian that is unable to know where or how to stand. I think the best definition I see of what abiding would look like is part "a" of Acts 17:28....when Paul was addressing the intellects at Mars Hill. Though its a statement to the lost, I believe we need look no further, just make a spiritual application of this portion of the verse without taking it out of context and we'll get what "abiding" looks like...."For in him we live, and move, and have our being:..." We live for and because of Christ. We move in our world and weigh/discern our actions & beliefs by the God's Word. We have our being as a saved child of the living God, through the shed blood of His Son alone! Abide in Him!" "May the word of God prepare us for His coming"
"May we learn to hide His words in our hearts"
"Reading God's Word changes people. :)"
"Yes Lord,i need more of ur word Lord." "48"He that rejecteth me,and receiveth not my words,hath one that judgeth him:the word that I have spoken,the same shall judge him in the last day. 49 For I have not spoken of myself;but the Father which sent me,he gave me a comandment,what I should say,and what I should speak. 50 And I know that his comandment is life everlasting:whatsoever I speak therefore,even as the Father said unto me,so I speak". (John 12:48-50)"
"A discerner of thoughts..I like it." "Amen ,God has exalted his word above his names." "Amen! Praise Him, for only He knows the heart of man!!! GLORY!!!!" "Amen! Praise the Lord for His sound doctrine! <3"
"Amen. And in it God's power is manifested." "And is a discerner of the thoughts and intents of the heart. That is the loaded part of the verse. As a right divider of scripture i know that the book of Hebrews is there for my information, but my doctrine is in Romans thru Philemon. If one considers Hebrews doctrine for today, then the thoughts and intents of one's heart has been discerned and they are not right." "And that is the strength of the word of GOD .amen!" "And to the law and to the testimony; if they do not speak according to this word, it is because they have no light in them. Isaiah8:20"
"As our hearts are soft and willing to obey the word of GOD, that word of GOD shall always reveal to us the aspects of our life that still need to be perfected so that we stand approved before GOD, in Christ Jesus." "Both ways. White or black." "From the words of our Father"
"God is no respecter of persons. We can try to live anyway we want, if we are Christians, but God will chastise us somewhere down the line." "God Word Will Be Established!" "His Word never returns void!" "I'm in luv wit dis scripture." "In my jesus name amen"
"May the Word of God quicken our flesh and soul in Jesus' name"
"Ooooo! ESPECIALLY! When the holy spirit speaks expressly through your minister Hebrews 1:7"
"Smiling - Thank you Jesus Amen"
"Th wad was wth God;n th wad was God;th wad was th source of life.No wad no God n no life.And z 2 him tht we mst all gv an account of ourslvs." "That is one powerful book, supernatural even." "Thats why atheist hate it." "The best and the most powerful Book ever written! Thank You, God, for Your Word!" "The more you eat of the word thw more healthier you become. it separates btn evil and gd." "The word of God is spirit and life"
"There is no were in this world were u can find a knife that does such amaizing&awesome deeds..the word of God is wandaful"
"This so true . Amen. Amen. Gods word is the ruler"
"True th word of God z alive n active ;shaper thn any double_edged sword......"
"What I needed to hear , thank you Lord." "Yes let d word get 2 ma marrow"
"Yes praise GOD ,the word of GOD is so powerful to any one ,i agree that ,thank you LORD ......."
"...is why I believe in the true church and true believers 'couse the Word 'll descern anysin so we sweep & wash it away for church to remain clean & Holy without wrinckles"
"AAAAAAAAAAAAAMEN Thank GOD For JESUS ." "After reading the comments below I felt this is what is like to be Christians together seeking, sharing and helping each other thru the love of Christ...It doesn't matter which church you attend, here we are all Christians sharing the teachings of the Bible...It has deeply moved me to tears...God bless each and everyone of you." "Aleluya to Jesus for his everlasting word awesome verse"
"Almighty GOD you're so powerful, merciful and loving FATHER !! HALLELUJAH !!" "AMEN - Cannot even comment on this as Our Father said it, and I believe it with all my heart, mind body & soul. Every word in this scripture is so easy to understand for HIS children & the Lost. Thank You Father! ALL PRAISES TO HIM." "Amen !! i like this !!!" "Amen greater is He who is in us than the one in this world"
"Amen halleluya...Praise your mighty name..."
"AMEN! And the Bible said too that the ...and the WORD WAS GOD!" "Amen! glory b 2 GOD"
"Amen! JAH WORDS most predominant." "Amen!!! I love u JESUS MWAUH"
"Amen, they cant keep the Truth from shinning. :D"
"Amen. i believe this word. and i am a testimony of his word. thank u God." "Amen. John 1 : 1 - 5 Jesus is the living word! Praise God. Glory to God!!! Halleluljah!! Halleluljah!! Halleluljah!!" "Amen. You are a blessing to me." "Amen...Judy I agree with you!" "Amen..Oh yes it is..The Lord JESUS, is a discerner of thoughts,he is so...powerful until it can break the strongholds of satan tactics that tries to come against us daily,The HolyGhost, has already prepared away for us to escape all temptations!! It's so..sharp until every sickness,&diseases has to come subject to its power,every demonic spirits has to bow down&confess that Jesus Christ is LORD!! Every religion has to confess also:) JESUS brings life to a dying soul!!!" "An ordinance is a commandment NOT given by Christ." "And we can let the Word discern our words, thoughts and intentions too if we choose to!" "But then, Christ's truth is the light on our path our lamp on our feet ---- and sets us free from all lies we've been living before. Thanks to His truth that's sharper than the two edge sword.for the knowledge of it,we obtain salvation by grace of the Lord Jesus...thanks so much to the working of the Holy Spirit." "By the works of the law no one is justified :"
"Colins thank u 4 dis word, dis word is 4 me it is well in jesus name, god bless u my broda,"
"Dats de same power dat separat man frm sin.amen"
"Even tho this was written to believing Israel, the word of God indeed does discern the thoughts and intents of the heart. Reading and rightly dividing the word of God causes it to work effectually in you. That is the real answer to sins and bad habits. The answer is not twelve step programs." 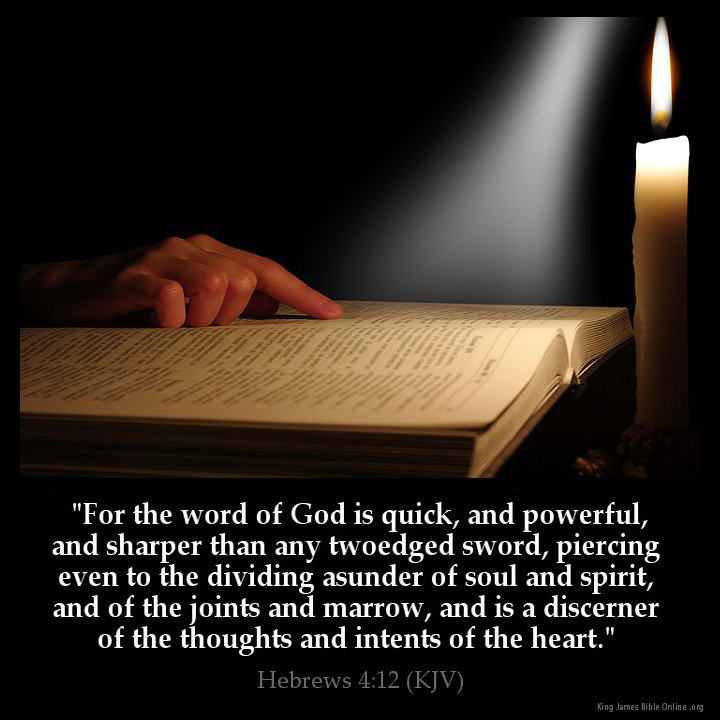 "For the word of God is quick(Alive), and powerful(Awesome), and sharper(Best) than any twoedged(Double-minded) sword(Person), piercing(Ouch) even to the dividing(Separating) asunder of soul(Mans Law/Singular) and spirit(Spiritual Law/Singular), and of the joints(Mans Laws/Plural) and marrow(Marrow produces Blood of Christ: Grace/Singular), and is a discerner(You ever thought about this instead?) of the thoughts and intents(Plans) of the heart. - Hebrews 4:12"
"Glory to God! He will send His power to strengthen me grant me peace of mind. In the mighty name of Jesus! Amen"
"God is so amazing this was our message this morning and now here it is again on FB the very same day. Coincidence I think not." "God knows what's in your heart and thoughts." "Haleluja..there is no sharp knife in this world that does amaizng deeds as the word of God..we surely can't do without the Holy Word of God"
"Heb 4:12 Porque la palabra de Dios es viva y eficaz, y m�s cortante que toda espada de dos filos; y penetra hasta partir el alma y el esp�ritu, las coyunturas y los tu�tanos, y discierne los pensamientos y las intenciones del coraz�n." "I KNOW FOR A FACT THIS IS TRUE!!!!!!" "I love this ...it makes me Very too COnfident of God's word"
"If by His word, created He what was not into existence! That tells me how great our God's word is!" "Into your word i comit my spirit and soul." "Is gud 2 listen 2 d word of God"
"Is it not do true!!! It sure does and if it doesn't we need to check our hearts"
"Itc a sword,for itc spirit -word of God Almighty,implying it bringc judgment whenever itc settles in the man"
"Keep us true Lord Jesus. Amen!" "KJV, the only one for me !!!!" "Let God be true and every man a liar"
"Let's glorify God for that bread." "LIKE the page NEW HOPE CHAMBER and get inspired for greatness." "Lord god fill my heart and mind with your word guard my steps to stay in the light of your word I love you god"
"Love it nothing beats His word"
"Luv this verse if scripture...."
"MY GOD LET ME ABIDE WITHIN YOUR WORD AND HAVE YOUR SPIRIT OF LOVE, SO WITH THIS SAID, PROTECT ME WITH YOUR HOLY ARMOUR AND DO NOT LET NO EVIL DESTROY ME, MAY YOUR SWORD AND SHIELD BE PREPARED FOR MY VICTORY AND STAND AGAINST MY ENEMIES,AMEN!" "Now to him that workth the wages not counted for favor but debt. hin that workth not but believes in him its counted for righteuness if its is by grace it is no more of works or else were grece no more grace"
"OooohWeee! YES! IT IS !!!" "Power house scripture for Gods word"
"Praise the Lord for his wonderful word. Hallelujah!" "Praise to you, O Lord Jesus Christ>"
"Praise You Lord! You are our Redeemer!" "PTL for this living word! John 1:1 In the beginning was the Word, and the Word was with God, and the Word was God. John 1:14 And the Word was made flesh, and dwelt among us, (and we beheld his glory, the glory as of the only begotten of the Father,) full of grace and truth. Jer 15:16 Thy words were found, and I did eat them; and thy word was unto me the joy and rejoicing of mine heart: for I am called by thy name, O LORD God of hosts. John 6:56 He that eateth my flesh, and drinketh my blood, dwelleth in me, and I in him. Amen, the divine Word of God is the Person of Christ & when we enjoy it we are actually being imparted & sanctified with His divinity. <3"
"Read it...understand it....apply it....it work!!!" "So be sure in all you do." "So powerful. Let God continue using u to tach our lives." "So true... it drives the wicked insane"
"THATS TO CUT UP THE DEVIL WHEN HE COMES OUR WAY !!!!!! AMEM !" "The Bible Daily KJV Jesus Name Amen"
"The communication of our God for us"
"The heart-hardened won't read it, that's the sad thing..."
"The ultimate truth , Amen"
"The Word of God cuts deep in spirit. None can resist it." "The word of God is great. Lets make every effort 2 keep his word, cos narrow is the way that leads 2 heaven. God bless you as you keep his word." "The Word of God is truly powerful. Thank You Lord. Amen!" "Ther iz no situation dat d word cant put right.it iz also d bst deliverer." "There is no hidden agenda with the word of God." "Therefore if it the word dominate your life it will start with the spirit to the soul and manifest in physical and you will be a living testimony"
"This is so very truthful!!!! Amen!!!!" "This verse lines up with 1 Thess. 5: 23 which prove we are a body, soul and spirit. Love how the Bible interprets the Bible. Amen"
"To God BE THE GLORY KING JAMES BIBLE is the BEST BIBLE"
"Two is significancy that both the soul and spirit its touch and so judged btn evil...it ieaves the weak fibble knees strength,its asynovial in the joints.and brings joy to the heart. whatc this word of God is LOrd Jesus christ who is word in our flesh wenever u study it. then the word and faith can't be separated otherwies christian growth is hampered-malnutrition in the spirit. the more u eat of the wor"
"Very quick and powerful..... Amen!!" "Wear the armore,,, don't be caught as Streaking Christian"
"What a powerful scripture. Read it 2-3 times to really internalize and appreciate the power of our God." "What a word! So good and so beautiful! I so much like this." "When Paul wrote these words, there was no New Testament. He was writing about the only Word of God he knew - - the Old Testament. Amazing!" "When you line this scripture up with 1 Thess. 5:23, you have a correct doctrine for us being a triune being, body, soul & spirit. This scripture is powerful." "WORD OF GOD...only bread for our lives.."
"Yes, we may hide our bad thoughts from everyone else but we will never be able to hide anything from God. I think about that a lot and always pray that he will take every mean and foolish thought away from my mind and heart." What Do You Think of Hebrews 4?